Powered by a strong V8 engine, the Chevrolet Tahoe seats up to nine and tows over 8,000 pounds. Four-wheel-drive is an option. For 2014, the Chevy Tahoe LS comes standard with the Convenience Package that includes power adjustable pedals, remote vehicle starter system and rear park assist along with rear vision camera and inside mirror with camera display. 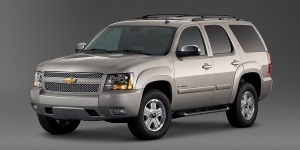 Find the used Chevrolet Tahoe of your choice from a dealer in your area. Search our used car listings now.